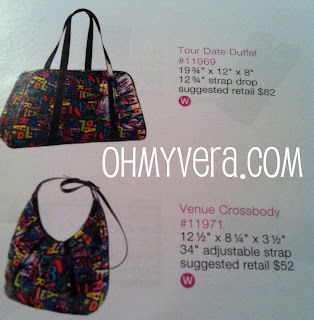 Vera Bradley's trying to be Dooney & Bourke? I dont really like the plastic look of these at all, nor do I like the initials. Not for me. Blech. Really cheesy and cheapy looking -- which means my teenager will love it! Hope they do ok with these because I now own their stock! LOL. Man, I really liked the rolling luggage in the preview video, but now that I can take a closer(ish) look at it, I'm on the fence. I don't mind the "pattern" (logo? I don't know what to call it), because I like that it looks like refrigerator magnets that spilled all over the floor, but I'm torn because I don't usually care for logos on bags, either. Thanks for posting the pictures! 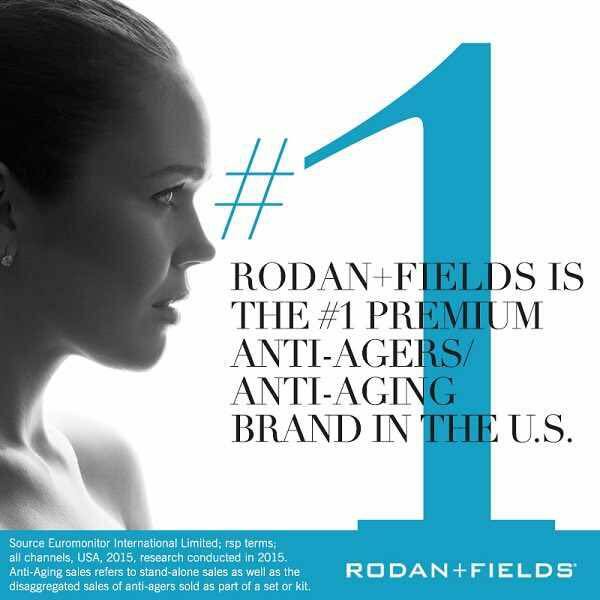 and my mom and sister have some, too! I definitely will not be buying Frill anymore the way this is! 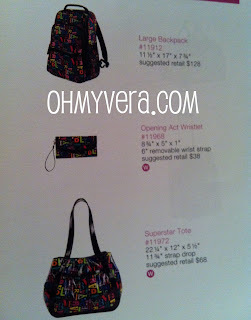 Do not like the copycat feel but I am curious to see the large backpack in person- thanks for posting! This is awful! I love frill but this is tacky and looks really cheap. Yuck, I usually like the frill, but not this time.....bring back the old frill!!! I saw these in person this weekend… I guess the store just put them out early. I was shocked, they are hideous and feel very cheap. I don't care for it either. Bring back the old Frill and put the outside print on the inside like they used to, instead of the solid color. Love your blog Allison, thanks for the pics. I really dont care for these. I agree with previous comments. my own opinion the primary colors? eeh reminds me of my kindergarden backpack. Women really dont want this do they? sad... love frill.. for exactly what it was... fell in love with vera indirectly through the concept of frill.. and its unique designs reflecting vera creativity.. versus other name brands streaked with their name brand... yuck..
hope vera switches back asap!!!!! We saw the pieces in the video and my teenage daughter said "Cool! Fridge magnets!" Somehow seeing that they are just the letters of "Vera Bradley" makes it seem less unique. I hope that this is not the trend for Frill, I was really looking forward to buying something in the "inside" pattern of Ellie Blue! are you sure this is frill? 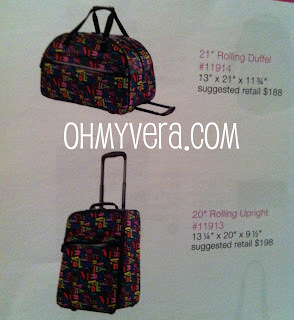 Occasionally Yours (local store) sent an email about this line and it is not called Frill but A to Z... I love love love love Frill.. sometimes more than the regular line. 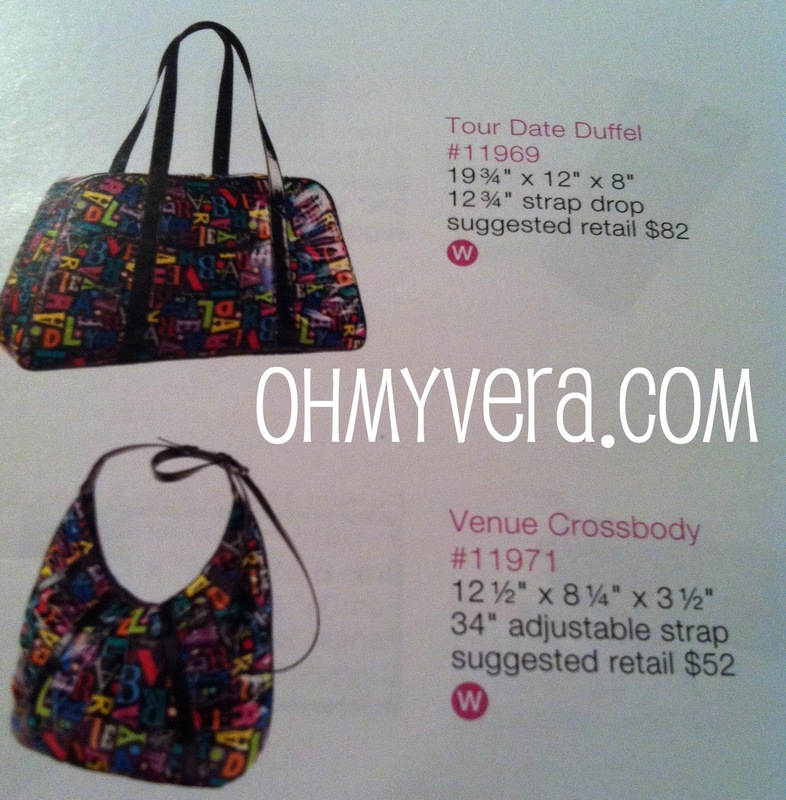 In the product guide book, the Opening Act Wristlet, Superstar Tote, Tour Date Duffel and Venue Crossbody are listed under "From A to Vera -- Frill" and the Large Backpack, Rolling Duffel, and Rolling Upright are listed under "From A to Vera -- Luggage". But I don't really care for them or for the new Chevron Medley line or the new Nylon line of bags. I think they are more for the younger set. I don't have the product guide, but in my copy of the Winter Catalog it's just called "From A to Vera" (no Frill). So I guess we'll just have to wait and see! I am with the rest of you; I hope this doesn't replace Frill.